Producer Sessions Live, the brand new event from Future Music and Computer Music, has announced two more artists for their live production masterclasses. James Hockley is a talented music producer, engineer and musician working from his base in the UK. He run's his own studio and record label, has signed and released tracks on Ministry of Sound, and worked with DJs such as Tall Paul and Brandon Block. More recently James has become a major part of Chicane, co-producing the top ten hit 'Poppiholla' in 2009, co- writing and producing the new album 'Giants' and remixing for Darren Styles, William Orbit, BT, Armin van Burren and Frankie goes to Hollywood. James is an Apple certified Logic Specialist. Next, Steve Mac is a UK House music veteran. DJing since the age of 11, he co-founded Disfunktional Records in 1995, releasing artists such as Danny Tenaglia, Junior Sanchez, Paul Woolford and Giorgio Moroder. Steve has continued to release on Cr2, regularly featuring in the Beatport top 10, had his track Lovin' You More feature on the soundtrack for Grand Theft Auto, remixed artists such as Jamiroquai, Wally Lopez, UNKLE and Simply Red, and hit number 17 in the UK singles chart last year with his tongue-in-cheek hit Paddy's Revenge. Steve is a Logic master, so watch him do his thing on Saturday at 10:30. 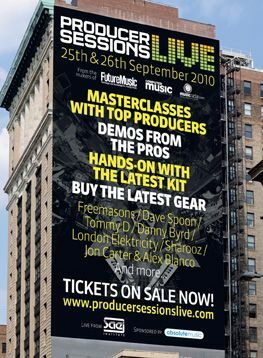 Producer Sessions Live - September 25th and 26th - www.producersessionslive.com.